Source: A free review copy from the author through instafreebie. Two Renegades So Controversial They Were Erased From History Discarded by society, she led a social revolution. Disgusted by war, he sought a new world. She was the first women to run for President, campaigning before women could vote. He was the Hero of Vicksburg, disillusioned with the government after witnessing the devastating carnage of the Civil War. Their social revolution attracted the unwanted who were left out of the new wealth: the freed slaves, the new immigrants, and women. This is the true story of Victoria Woodhull and the love of her life, James Blood. Adored by the poor, hated by the powerful, forced into hiding during their lifetimes and erased from history after death, the legend of their love lives on. It’s 1869 and Victoria has a choice to make. 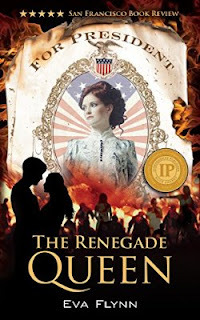 She can stay in an abusive marriage and continue to work as a psychic, or she can take the offer of support from handsome Civil War general James Blood and set about to turn society upside down. Victoria chooses revolution. This is my first book on American history. The story is about Mrs.Victoria Woodhull who is raised in a poor family as 6th child and had an abusive childhood. She has a gift of being able to talk to spirits which her father uses to his advantage to earn money. She is tortured and kept in delirium with opium to earn money as per her father's wish. Surprisingly, Victoria has optimism and ambition in her life to fight for women equality and right to vote even though she herself is chained. She is a strongly opinionated individual and a rebel. She is kind of a woman who can go to any extremes and bear pain to fight for the rights of women. Those were the days when women were treated as slaves, and woman's only objective of life supposed to be to please her man and take care of home. The story, the narration and characters inspired me throughout the novel and it is interesting to know about women in 80's in USA. Victoria's positive spirit, boldness and her stubborn nature to do some good for future generations of women is exemplary. I couldn't accept the climax though. Since it is based on real incidents, I cannot complain about that. I appreciate the author for her research work and wish her the best for next part of the series. I am looking forward to read the next part actually. I would recommend this to history and politics lovers. Do you know what Chicago means?” Canning asks. I shake my head. “It’s an old Indian word for foul smell"
Ps: Received the book from the author in exchange of an honest review.